Khadija Ismayilova (b. 27 May, 1976) is an investigative journalist and radio host from Baku, Azerbaijan. After graduating from Baku State University with a degree in philology in 1997, Ismayilova went on to build her career in journalism, working for various foreign and local media outlets. 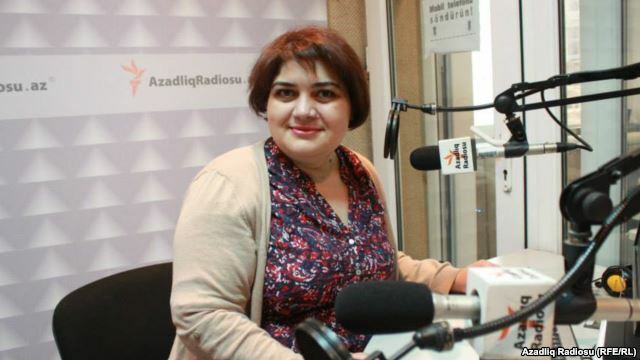 From 2008 to 2010, she served as the head of the Azerbaijani service of Radio Free Europe/Radio Liberty (RFE/RL), and continues to report and broadcast for the service. In recent years, Ismayilova focused her investigative efforts on uncovering corruption and financial abuses of high-level government officials in Azerbaijan, including President Ilham Aliyev and his family members. Ismayilova’s fearless endeavors to hold the Aliyev regime accountable, and introduce transparency regarding the financial reporting of Aliyev’s enormous wealth rendered her a target for what many see as a state-endorsed retaliative smear campaign. Since 2012, Ismayilova has been mercilessly subjected to harassment, threats, surveillance, blackmail, violations of privacy (including having intimate details and footage shared online), and attempts to silence her both personally and professionally. In January 2013, Ismayilova was detained for peaceful protest, and upon refusing to pay the ensuing fine, she was sentenced to 220 hours of community service. Ominously, Ismayilova predicted her subsequent arrest, which eventually occurred on 5 December, 2014. She was accused of inciting a colleague to attempt suicide, and these charges were later expanded to include tax evasion, embezzlement, abuse of power, and illegal business activity. Ismayilova, her family, and her lawyer Fariz Namazli maintain that these charges were fabrications of the state, invented as a means to imprison her and discredit her reporting. Much of Ismayilova’s investigative work was later corroborated by the Panama Papers, and instead of silencing dissenting journalistic voices, her arrest only served to ignite both local and international fervor in support of her work, with reinvigorated focus on anti-corruption, as well as international disdain for Azerbaijan’s impunity for crimes against journalists. Despite amendments to the state’s charges, in September 2015, Ismayilova was found guilty and sentenced to seven and half years in prison. PEN International President Jennifer Clemet highlighted that, “the appalling treatment of Khadija Ismayilova by the Azerbaijani authorities is symptomatic of a relentless crackdown on journalists and freedom of expression in the country in recent years”. Journalists, writers, artists, and NGO heavyweights rallied around Ismayilova in messages and acts of support. In January 2016, PEN International, ARTICLE 19, International Media Support (IMS), the Committee to Protect Journalists (CPJ), and the International Partnership for Human Rights (IPHR) joined forces to submit a third-party intervention on behalf of Ismayilova to the European Court of Human Rights. Videos, tweets, letters, facebook posts and campaigns of support flooded into Azerbaijan demanding justice and freedom for the imprisoned journalist, and eventually on 25 May, 2016, Ismayilova was released, in time to celebrate her 40th birthday just two days later. Although Ismayilova’s release was a welcome development, she remains far from truly free. Her sentence is now a three and a half-year suspended term, and the restrictions of her probation prohibit her from traveling abroad for 5 years without official permission, and stipulate that she reside in Baku. In many ways, Ismayilova remains a prisoner in her own city, with authorities in Azerbaijan continually attempting to silence her. Refusing to be intimidated, even at the risk of returning to prison, Ismayilova continues her work as a host and journalist, and seeks to empower dissenting voices around the world by courageously using her own to uncover corruption. Ismayilova has been recognized for her achievements as the recipient of several international awards, including the Courage of Journalism Award (International Women’s Media Foundation, 2012), the PEN/Barbara Goldsmith Freedom to Write Award (2015), the Anna Politkovskaya Award for Reporting on Corruption (2015), the Alison Des Forges Award for Extraordinart Activism (Human Rights Watch, 2015), and the UNESCO/Guillermo Cano World Press Freedom Prize (2016). Norwegian PEN and the Writers in Prison Committee proudly include Khadija Ismayilova among our honorary members.